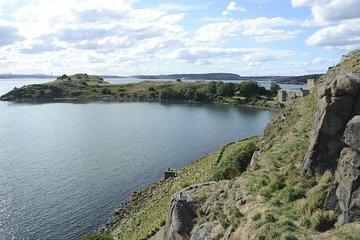 Upptäck Edinburghs höjdpunkter och historia på en 3-timmars stadsbussresa och kryssning längs Firth of Forth. Belägen på en sightseeingbuss och njut av fri utsikt över Edinburghs största attraktioner, såsom slående georgiansk arkitektur på UNESCOs kända Princes Street. Efteråt, överför till en all-weather båt och segla av sevärdheter som Forth Rail Bridge, Forth Road Bridge och Inchcolm Island - och håll dina ögon avskalade för inhemska sälar och lundar! We had a problem with this tour as we were on a cruise ship and thought the boat tour was more local to Edinburgh. I misunderstood the itinerary and it seemed like we might not be doing what we wanted to. The Viator representative exchanged our tickets for the hop on and off tour and we were extremely pleased with that tour. Great tour! Relatively short bus journey to South Queensferry but it provided interesting info along the way. South Queensferry was a very sweet town with nice little shops and an excellent, rustic bakery. My husband has never been to Scotland before so I wanted him to see the beauty and incredible engineering of the Forth rail bridge. He had seen the bridge in pictures but was absolutely gobsmacked by the structure after seeing it in person. The boat cruises underneath all three Forth bridges, then toward Inchcolm island - with the option to stop there if you'd like. We saw seals and various birds. The tour commentary was great and those on the Viator tour received complimentary scones with clotted cream and jam, as well as tea - so British! -. Would highly recommend this tour. It costs 6L more to get off and tour the Inchcolm island, but it is the heart of the trip. The old abbey ruins are fascinating. The gift shop has a reasonably priced booklet on its history. There are also WWI and II defensive posts remaining. Grey sea lions and possibly puffins await. Do it! The boat tour was the best part of this tour. The self listen to bus tour I would not recommend. A very interesting and enjoyable tour where can admire historical sites, visit Inchcolm Island and see the other small islands while criusing along the river and admiring the amazing wild life. An unforgettable experience and a tour worth taking! Although it was raining, this excursion was great, we really enjoyed it. The bridges are really fantastic, also the Abbey is beautiful, although we did not stop there due to whether conditions. The best were the seals!!! We saw a lot of them!! The ship went very close to the rocks where they were resting, so we had a great chance to have a look at them and take some photos. I would recommend the tour, don't miss it! It was Fantastic. The value of money and good quality time we spent on this Bus and Boat tour. It was the best bus tours in Edinburgh we had. Thank you very very much. The Edinburgh bus and boat tour. The Forth Bridge is an amazing feat of engineering and worth going to. The boat tour was great and I also got to see seals. You get great view of the Forth Bridges!